PennsylvAsia: Greater Pittsburgh Chinese New Year Gala, February 2 in the North Hills. Greater Pittsburgh Chinese New Year Gala, February 2 in the North Hills. The Chinese Association for Science and Technology - Pittsburgh Chapter will present the Greater Pittsburgh Chinese New Year Gala on February 2 at Marshall Middle School in Wexford. 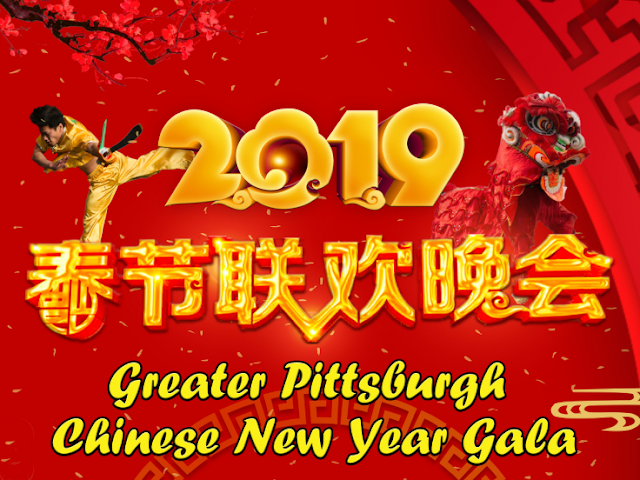 Dear friends in Greater Pittsburgh, the 2019 Chinese New Year Gala is just around the corner on February 2nd! Chinese New Year, also called Spring Festival, is the biggest festival in China. 2019 is the Year of the Pig, which represents luck, fortune, and prosperity. The Chinese Association for Science and Technology - Pittsburgh Chapter (CAST-P) along with other major Chinese cultural organizations and groups in the Greater Pittsburgh area will bring you a lively and colorful New Year celebration! A Chinese comedy sketch - new to the Gala this year! Rock music, waist drum dance, traditional Chinese Qipao dress show, and more! Opportunity to win a variety of surprise prizes in our lucky draw! The Greater Pittsburgh Chinese New Year Gala is sure to be an exciting and joyous night for all ages! Tickets are now available online for $10. The school is located at 5145 Wexford Run Rd. in Wexford (map), roughly 15 miles north of the city.